Welcome to the Bellano Creek subdivision offering new homes for sale in Meridian, ID. With 168 homesites and 18 floor plans to choose from, you are sure to find the home that's just right for you. You will enjoy the refreshing swimming pool, two community parks, playground, walking paths and foothill views, without sacrificing on the lot size. Modern and elegant, the up to 1/2 half acre homesites are conveniently located just minutes from shopping, dining and the new Ten Mile Interchange. Read more about Bellano Creek real estate below. Browse all New Homes in Meridian or view the complete guide to New Meridian Subdivisions. 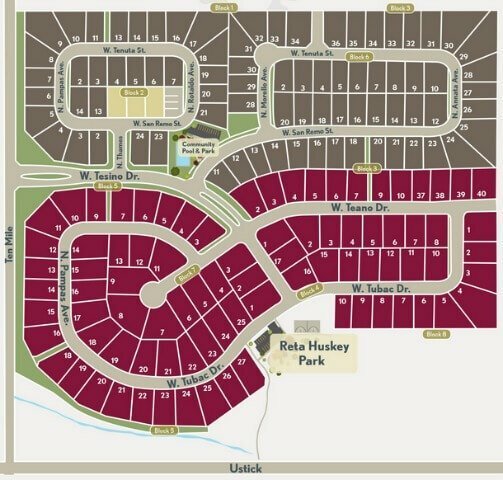 Homesites: 168 building lots from 0.104 acres (4,530 sq ft) up to 0.479 acres (20,870 sq ft). North from Ten Mile and Ustick Roads. Turn East (right) at Tesino Dr. Contact us for the latest information about Bellano Creek real estate & homes for sale in Meridian - (208) 391-4466.